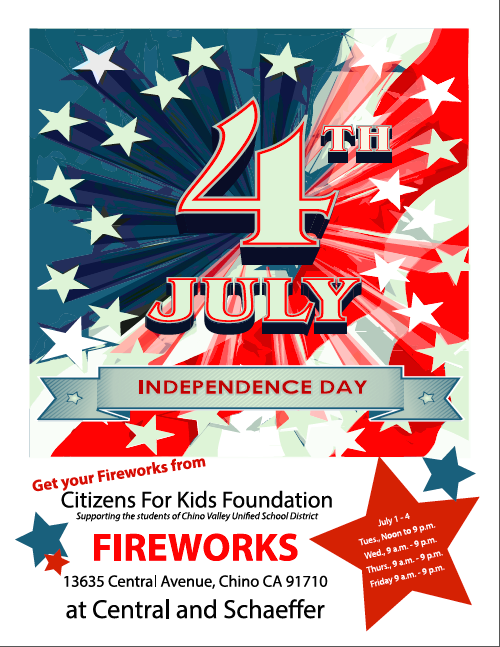 Help support students in the Chino Valley Unified School District by buying your legal fireworks from the Citizens for Kids Foundation! From time to time, we come across wonderful organizations – organizations that are dedicated to helping improve the lives of others. We are so inspired by these types of organizations, that we feel the need to share them with our readers. Comfort Zone Camp is one of those organizations. Comfort Zone is a nonprofit organization that provides a safe environment for children and teens to grieve after having suffered the loss of a loved one. According to Comfort Zone Camp, the camps are free and they “include confidence building programs and age-based support groups that break the emotional isolation grief often brings.” The camp is available to children from 7 to 17 years of age. Comfort Zone Camp is funded through donations given by groups and individuals that donate money and time, because they believe in the cause. If you would like to volunteer and help heal a young person’s heart, if you would like to donate money, or if you would like to register a camper, be sure to check out their website. We hope more people will become more involved in organizations like Comfort Zone Camp. The Tutoring solution provides tutoring in Chino Hills, Norco, Eastvale, Chino, Alta Loma, Ontario, Corona, Riverside, Mira Loma, Rancho Cucamonga and all the surrounding cities. We have students from Heritage Oak Private School, Sky Country Elementary, Oxford Prepatory Academy, Townsend Junior High School, Roosevelt High School, Alta Loma High School, Norco High School, Centennial High School, Chino Hills High School, Ontario Christian High School and Ayala High School. If you would like tutoring for your child, feel free to email us (thetutoringsolution@gmail.com) or call us (909-238-8233). We look forward to working with you. We hope you all had a wonderful Thanksgiving. Many of you were grateful for the days off of work or school, and for the opportunity to spend time with family and friends that you don’t get to see on a regular basis, for your health, your career, and so much more. Although we are grateful for all those things, this Thanksgiving we thought about those of you who have helped our tutoring company grow and to the people who inspire us to be and do better. We are thankful for those individuals/organizations that work hard every day to improve the lives of others and, as a result, improve the different communities and the world we live in. While looking ahead for the new year we want to keep in mind those who inspire us, learn from them, and do everything we can to improve the lives of students in our community. 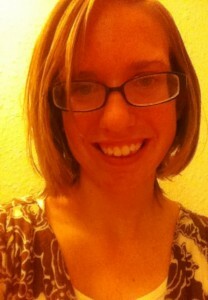 We would like to start off by giving a special thank you to Julia Schemmer. Julia Schemmer was the winner of our Norco High School Share Your Passion Scholarship. In her essay, she talked about how her sister’s battle with cancer inspired her desire to become a doctor and help others. We were so inspired and moved by her story that we awarded her as the Norco High School Share Your Passion Scholarship Winner. Nonetheless, we became even more moved when she later contacted us to promote her Facebook Fan Page for the organization she founded called, The Face of Cancer. Her organization is devoted to helping cancer patients deal with the hardships of the illness. She wrote a blog article for our webpage, sharing the purpose and goals of her organization. She is truly one of the most inspiring young people we know and we would love for all of our readers to check out her Facebook Page and support such a wonderful cause. We want to thank all of the counselors, teachers, and tutors that work very hard, every day, in order to provide all of our students with a wonderful education and a great learning experience. We are fortunate to know wonderful people who are devoted to helping students become knowledgeable and prepared young adults. These individuals go above and beyond, and they do more than what is expected of them, because they understand the value of education. Additionally, organizations like School on Wheels and United Way, continue to enthuse us with the wonderful services they provide for disadvantaged youth. School on Wheels offers free tutoring services for homeless students, while United Way created a mentoring program in order to offer mentors for disadvantaged youth. Both these organizations’ desire to help disadvantaged kids inspire us to become better and strive for new ways to help more kids in our community. 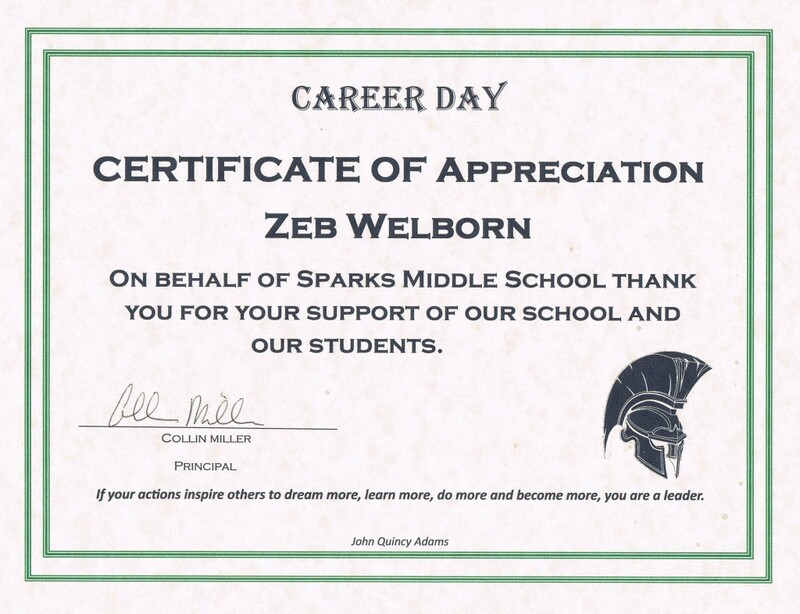 Finally, we would also like to thank Zeb Welborn, the founder of The Tutoring Solution and Welborn Social Media, for inspiring us to be better as well. His goal has always been to motivate others into following their passions and living fulfilling lives. He began The Tutoring Solution, precisely because of that goal; he wanted to motivate students to live up to their full potential and to grow to love learning as much as he did. 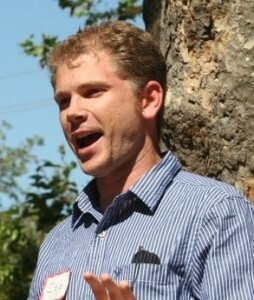 He since has moved on to run Welborn Social Media, a company devoted to helping small to medium sized businesses grow. We thank him for his efforts to improve our community. These wonderful people/organizations make us feel inspired. We are so excited for the new year and can’t wait to help even more bright young minds reach their potential. In order to grow even more, and provide more tutoring services for students who aren’t meeting their potential, we need your help. We would really appreciate it if you would post a review/recommendation on Google Places. By doing so, you will let other parents know about our services and allow us to grow as a company and help other students succeed in and out of school. We are constantly looking for new ways to help the community and to help improve the lives of students. If you have any suggestions or know of any organizations/causes that need help, please email us and let us know. We genuinely hope to make a difference and help improve the lives of others. If your child needs help in improving his or her grades, do not hesitate to send us an email or give us a call today, (909) 238-8233. We can help your child grow into a confident and motivated learner. We provide tutoring in Southern California in all subjects and grade levels.We are constantly looking for new ways to help the community and to help improve the lives of students. If you have any suggestions or know of any organizations/causes that need help, please email us and let us know. We genuinely hope to make a difference and help improve the lives of others. We provide tutoring in Eastvale, Chino, Chino Hills, Mira Loma, Alta Loma, Ontario, Corona, Norco, Rancho Cucamonga and all the surrounding cities. We have students from Sky Country Elementary, Oxford Prepatory Academy, Townsend Junior High School, Roosevelt High School, Alta Loma High School, Norco High School, Centennial High School, Chino Hills High School, Ontario Christian High School and Ayala High School. When asked her goals for the future, #100 Norco High School Share Your Passion scholarship winner, Julia Schemmer replied, “Change the world.” Passionate in the medical field, Julia not only aspires to be a missionary doctor but has also founded her own organization, The Face of Cancer. The Face of Cancer is a Facebook project launched in September 2012. Its primary function is to give support to Corona-Norco cancer patients. “It’s easy to see the cancer ribbons, or to be asked to donate,” she says, “While these are equally important, there is a great malnourishment of actual support to these patients.” Their past two events have been a huge success. Julia hopes to expand the organization by setting up a Pen Pal system with a member of the Face of Cancer and a cancer patient. $250 Share Your Passion Scholarship – The deadline for the $250 Share Your Passion Scholarship is finally up. We received quite a few entries and we will be announcing the winner of the first annual Share Your Passion Scholarship soon. We were excited to receive so many wonderful entries from dedicated, intelligent, and passionate young students who are bound to have bright futures and will make the world a much better place. Although we received an overwhelming response, we have narrowed it down to four finalists for the $250 Share Your Passion Scholarship Essay Contest. We will be announcing the winner on Facebook, so make sure to “Like” us on Facebook to find out the winner of the first annual Share Your Passion Scholarship. $100 Facebook Contest Scholarship – In addition to winning the $250 Scholarship, the four finalists, plus our two past winners, Jennifer Aneke and Julia Schemmer, have an opportunity to win our $100 Facebook Contest Scholarship. We will soon be posting the essays on Facebook and Facebook users will be able to vote for the one they think is the winning essay. “Like” us on Facebook so that you will be alerted when the time comes to vote for the winning essay. Help us pick a winner by selecting the most qualified essay and voting for them. GATE Together – We were excited to participate in the GATE Together workshops again this year. On Saturday, May 19th, we presented a workshop on the benefits and reasons for becoming a blogger. Most students walked in having a vague idea on blogging, but they walked out excited to start their own blog on topics ranging from animals, to video games, to music. There is nothing more rewarding than presenting a new and fun topic to intelligent students who are eager to learn. We really appreciate the Chino Valley Unified School District for inviting us to present again this year. Macaroni Kids – We wanted to take this opportunity to share with our readers a wonderful website and blog called Macaroni Kid. If you are not familiar with Macaroni Kid, be sure to click on the link and check them out, they are a group of moms that provide their readers with information on kid-friendly family events and activities that are happening in our communities every week. They provide great opportunities for parents to take their kids to fun activities and spend quality time together as a family. Our Prominent Articles – If you have visited our blog yet, please be sure to do so. This month we wrote articles on the different types of intelligence, we looked at different learning styles, we took a closer look at the STAR test, we tackled the bullying problem, and we covered how to improve your child’s self-esteem in 3 different articles – learning to listen, teach your children about their culture and history, and remind them that you love them every day. We always strive to open communication between parents, tutors, students, teachers, counselors, and anyone else invested in children’s education, so please feel free to comment on our articles and share your opinions. We are tutoring students in Chino, Chino Hills, Eastvale, Mira Loma, Alta Loma, Ontario, Corona, Norco, and Rancho Cucamonga at Sky Country Elementary, Oxford Preparatory Academy, Townshend Junior High School, Roosevelt High School, Alta Loma High School, Norco High School, Centennial High School, Chino Hills High School, Ontario Christian High School and Ayala High School. Please be sure to take advantage of summer tutoring and sign up with us today. We provide one-on-one in home tutoring in Southern California and we would love to help your children succeed in and out of school. On Saturday, July 16th, 2011 and again on Monday, February 6th, 2012, we had the honor of sharing our knowledge on tutoring and motivation with the School on Wheels tutors. We felt extremely privileged to be asked to conduct these two workshops and we cannot begin to express our gratitude. We are great supporters of the School on Wheels organization, and we sincerely respect all that they do for homeless children. It is because of organizations like School on Wheels, that homeless children are better able to reach their full potential and to feel that their contribution to society matters. These volunteer tutors make these kids feel like important and valuable members of society, as they should be made to feel. Natasha Bayus, the education and training coordinator for School on Wheels, was kind enough to share with us some of the participants’ feedback. The overwhelming majority said that they learned how to interact and communicate with their students more effectively, and in turn, this helped them understand what tools to use in order to connect with their students and to motivate them to become more involved in their education and to value its great importance. Many participants also felt more comfortable about contacting the student’s teachers and parents after participating in the workshop. They realized the importance of working with the teachers and parents in order to improve the student’s grades and understanding of the material being learned. There is nothing more important than having the students know that their success and learning matter and that there are many individuals that care about them and that are invested in their educational growth. Nonetheless, out of all the lessons the tutors learned, the most important seemed to be to let their students’ learn from their mistakes. Instead of being made to feel ashamed, children should learn that we all make mistakes and that that is how we learn and grow. Most of all, students should feel positive about their learning experience. Education is what keeps us all going. Give us an opportunity to show you how one-on-one tutoring can benefit your child’s future. This link should not be shared with others; it is unique to you. computer’s microphone and speakers (VOIP). A headset is recommended. joining the Webinar and call in using the numbers below. Last Summer I gave a presentation to a group of volunteer tutors from School on Wheels titled How to Motivate the Unmotivated. School on Wheels has provided volunteer tutoring for homeless students in the Los Angeles area since 1993 and I received a lot of positive feedback from those who attended and received the following email several weeks ago to ask if I was interested in running an online webinar to which I agreed. It sounds like things are going really well for your company. Your workshop for our tutors was very popular last year. I’m wondering if there’s any chance you would be interested in doing another for us, but this time in an online format. We are offering online webinars, and I would love to offer your strategies and professional expertise to more of our tutors. If this interests you, please let me know and we can discuss times. I could come to your office to run the workshop in order to make it convenient for you. Education and Training Coordinator | School on Wheels, Inc. The presentation is set to take place on Monday at 7 PM and they already have a large list of volunteer tutors interested in attending. I am excited for the opportunity and am always happy to share my time and expertise with those interested in helping others. School on Wheels is a great organization and I encourage all of you to visit their website to find out more about them. The Tutoring Solution is excited to have a table at My Kid’s Dentist’s Community BBQ. My Kid’s Dentist has locations throughout California, Colorado, Nevada, Texas and Utah. They are committed to pediatric dental care and creating a “safe, warm and fun” environment for their patients. The Chino Hills location is proud to be hosting a community BBQ to promote local businesses. 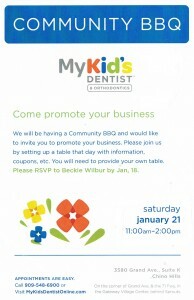 The BBQ will be held this Saturday, January 21 from 11 to 2 in the Gateway Village Center. It is located on the corner of Grand Ave and the 71 Fwy, at 3580 Grand Ave, Chino Hills. The Tutoring Solution will be hosting a bean bag toss for the children. Come on out for fun activities, learn about other local businesses and eat some good food.